MacLean has organised and performed in the Perthshire Amber Festival, Birnam & Dunkeld, alongside multiple performances at Celtic Connections, Glasgow. In 2011, MacLean was invested as an Officer of the Most Excellent Order of the British Empire (OBE). In 2013, MacLean was awarded the BBC Radio 2 Folk Award for Lifetime Achievement for Contribution to Songwriting. The award was presented by First Minister Alex Salmond at Glasgow Royal Concert Hall. ↑ "Albums by Dougie MacLean". Rate Your Music. Retrieved 6 April 2013. ↑ Harris, Craig. "Dougie MacLean: Biography". Allmusic. Retrieved 8 April 2012. ↑ "Caledonia Best Bring Together Dougie Maclean and AMWWF for New Version of 'Caledonia'". PR Newswire. 15 February 2013. Retrieved 7 July 2013. 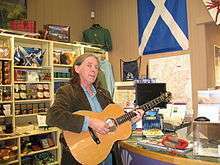 ↑ "From Doc Watson to lifetime folk award, Dougie MacLean sings on". Reuters. 30 January 2013. Retrieved 5 February 2013. ↑ "2013 Merlefest Artist list". ↑ Emblen, Frank (23 February 1986). New Jersey Guide. "The New York Times". Accessed on 14 August 2007. ↑ "'Caledonia' folk writer receives OBE". BBC. 31 December 2010. Retrieved 4 February 2011. ↑ "BBC Radio 2 Folk Awards recognises Scots legends". Scotsman. 31 January 2013. Retrieved 5 February 2013. ↑ "Dougie Maclean celebrates Folk Award with star-studded Caledonia rendition". Daily Record and Sunday Mail. 1 February 2013. Retrieved 5 February 2013. ↑ "BBC2 Folk Awards 2013 Winners". Retrieved 5 February 2013.